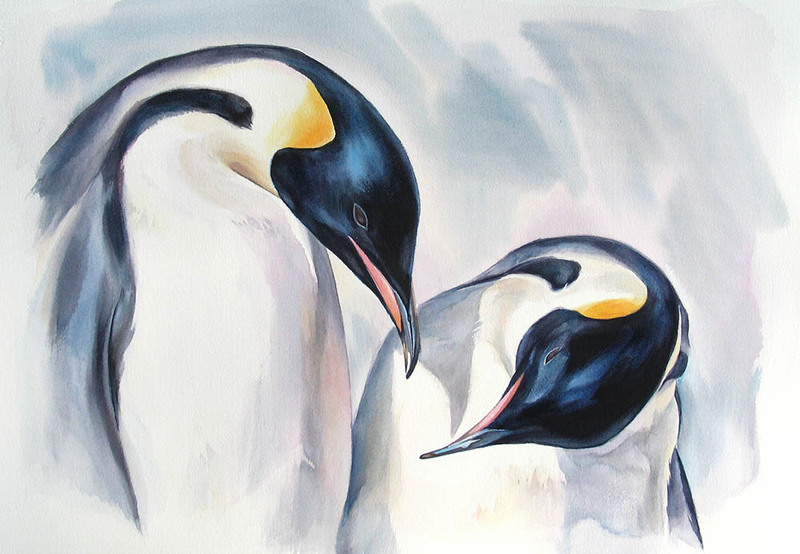 These paintings were inspired by a Expedition to a remote Emperor Penguin rookery near Snow Hill Island on the Weddell Sea. The trip to visit the emperor penguin rookeries of Snow Hill Island from November 2-14 was a whole new experience in landscape painting for me. It brought back the experience years of life drawing at Art College. Penguins are at first very simple and cartoon like to draw and paint, but one soon realizes the individual traits, complex gestures and body language of these hardy creatures. 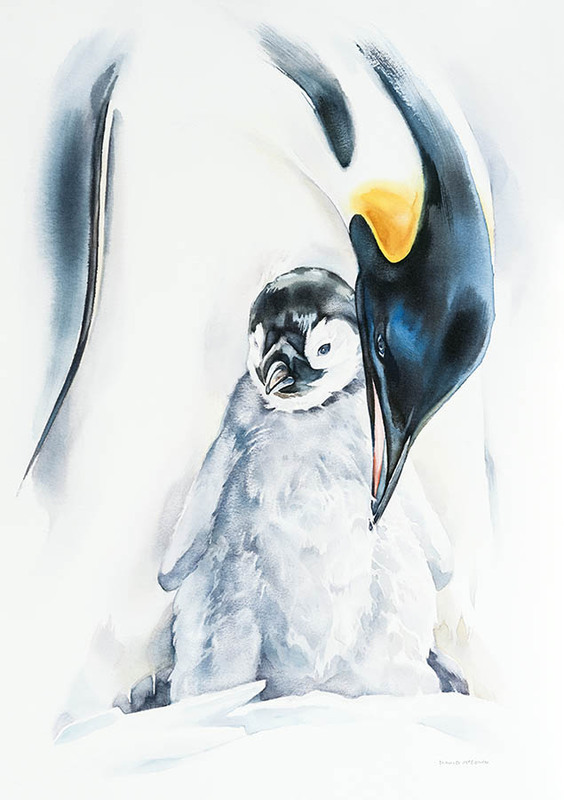 There is a temptation to anthropomorphize penguins, however paying attention to how they echo the shapes and colours of their habitat can make for a truthful homage on paper. The rule for approaching the penguins is 15 feet or 5 meters, but this has to be done in a quiet and gentle manner. Unlike most other places, wild life here have no fear or experience of humans thus are great models. If one just stays still, the penguins and chicks will approach you with curiosity since they have no 15-foot rule. 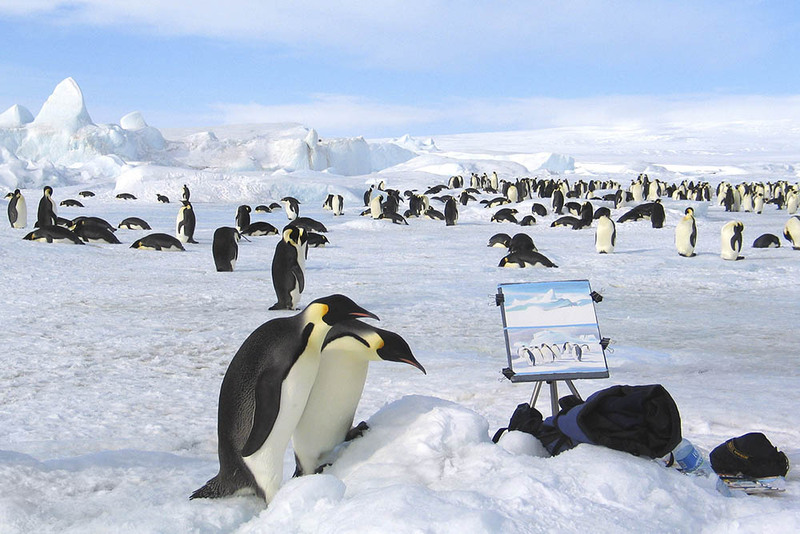 I will start drawing some of the key penguins before they walk out of the picture, or up to my painting for a critique! The chicks are unbelievably cute, yet the harsh reminder of life and death is all around. Some chicks are emaciated waiting to be fed or have lost their parents. Many of the dead chicks are picked clean to the bone from the giant petrals and skuas. Emperors can weigh up to 90lbs and standing 3 feet tall when they stretch. They are so gentle and non aggressive, to have one look down at you eye to eye while you sit, truly is comparable to being visited by an extraterrestrial being. However realizing this is our fellow creature just trying to make a go of it on this planet warms the heart and wonder of it all! For more information on the antarctica project and works from other penguin colonies visit the Antarctica project.